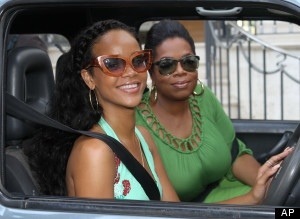 Oprah Winfrey sat down for a very candid interview with Rihanna in August, where the singer broke down in tears when talking about her relationship with Chris Brown, who brutally assaulted her following a 2009 Grammy Awards party. But now that Winfrey knows Rihanna and Brown are considering getting back together, the talk show host is passing no judgement. Winfrey believes she truly understands 24-year-old Rihanna and how she has come to forgive Brown, 23, after all these years. In her discussion with Winfrey, Rihanna revealed that her dad, Ronald Fenty, was physically abusive towards her mother. But as she got older, the singer learned to see past his wrong doings and accept that he was struggling with personal demons that he has now conquered. Winfrey thinks Rihanna is forgiving Brown the same way she forgave her father. “If that’s how you choose to lead your life, that’s really okay,” Winfrey expressed. This entry was posted in Celebs and tagged advice, Chris Brown, Opinion, Oprah, relationship, Rihanna. Bookmark the permalink.